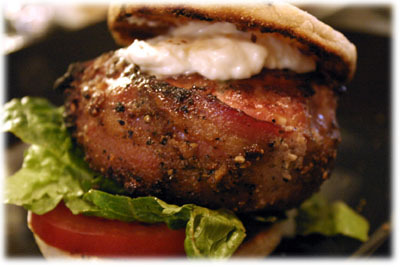 I honestly had no idea how this turkey burger recipe was going to turn out when I started. I had half a dozen random ideas floating in my head about what a grilled turkey burger should be but it wasn't until I actually started putting them together one Sunday afternoon that I hit the jackpot with this recipe. I think even my family was surprised. Which isn't really a surprise. 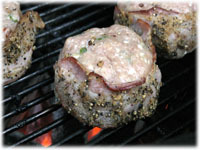 When you think of BBQ & grilling recipes you may not immediately think of turkey burgers, but I was very surprised to learn just how popular they actually are. And they're also a nice diversion from regular beef burgers. Here's a bonus, if you're looking for a chicken burger recipe this one works for that too! Load these up with diced jalapeno's, garlic and a few spices and you're ready to wrap them in bacon coated with crushed peppercorns and garlic. I recommend cooking this recipe to an internal temperature of 165F instead of relying on timing as the thickness of the burger determines how long they need to cook. 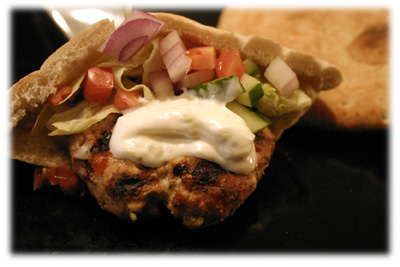 Tip: to make this a chicken burger recipe just substitute ground chicken for the ground turkey. You'll need 1 strip of uncooked bacon for each turkey burger you're making. 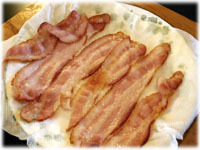 To start, place 6 strips of uncooked bacon on a microwave safe dish and cover with paper towel. Cook on high for 2 minutes and 30 seconds. Remove from the microwave and allow the bacon to cool just enough that you can handle it. 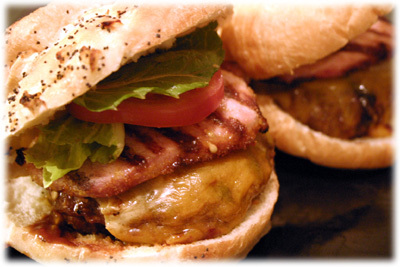 Repeat with more bacon until you've enough partially cooked strips of bacon, 1 for each burger. 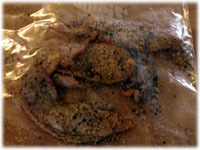 Place the partially cooked bacon in a plastic resealable bag and add the crushed black peppercorns, brown sugar and garlic powder. Shake well to full coat the bacon and refrigerate. 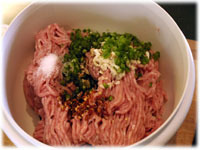 In a large mixing bowl combine the ground turkey (or chicken), diced jalapeno and garlic, Worcestershire sauce, crushed red pepper flakes and salt and the bread crumbs. Ground turkey (or chicken) can be quite moist and mushy so the bread crumbs help keep it together. Mix well and form each patty using about 1/2 cup of the mixture. Wrap 1 strip of the seasoned bacon around each turkey burger patty and secure with a toothpick if it won't stick by itself. Refrigerate the turkey burgers at least 1 hour. Clean and oil the grates of the grill and preheat to 500F - 525F. 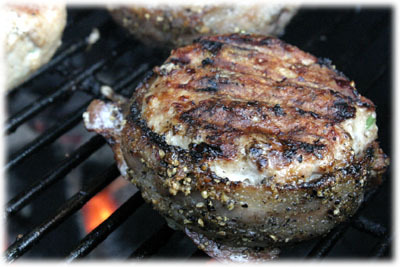 When the grill reaches this temperature range place the turkey burger recipe on the grill and close the lid. 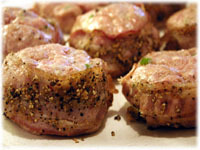 After 6 - 8 minutes peek under one of the turkey burgers and if browning nicely then carefully flip them over. After another 6 - 8 minutes measure the internal temperature of the largest burger. If it's 165F then remove the turkey burgers from the grill, cover and let rest 5 - 10 minutes while you toast the English muffins. 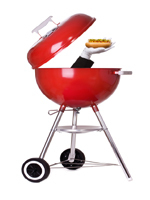 Slice each English muffin in half and brush each cut side with a little melted garlic butter and place buttered side down on the BBQ grates. Cook several minutes just until the muffins are toasted and remove and cover to keep warm. Try serving these with freshly sliced tomatoes, lettuce and mayo. You could even substitute the English muffins for croissants if you wanted. Tip: If you want to use cheese I recommend sliced Havarti. It's a very mild cheese that enhances food without overpowering it.